Mukavaa lauantaita, lähetän synttärionnittelut Arjalle ja Teemulle. Tervetuloa viikon Allsorts haasteen pariin! "Ruusuja" on sopivasti aiheenamme. Hi; Happy Saturday, it's time for a new Allsorts Challenge! 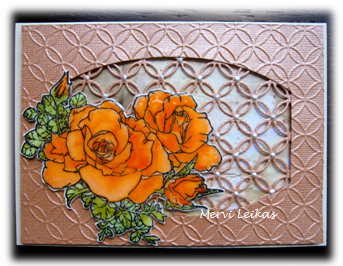 Helene's theme is "Roses"
I made few cards with a little different shades. pattern paper below; liquid pearls. Some roses had UTEE on too. 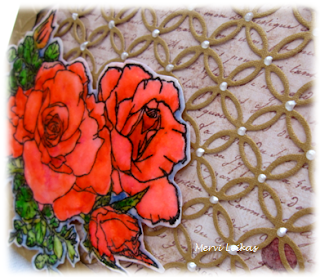 A gorgeous card for this weeks theme Mervi, lovely vibrant roses. 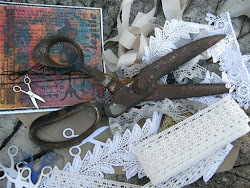 Also perfect for our them at Stamping Sensations, many thanks for joining in. It's a good idea to make more cards when you've found a design that works. And when you can't decide on colors, better then to make more:) they're beautiful. Gorgeous roses, Mervi. Loving the pretty colors and wonderful design! Fab card, great colours and beautiful colored roses ! The layers on this card - oh my! How very lovely! Such a gorgeous cards. Love your coloring of the flowers and beautiful backgrounds. 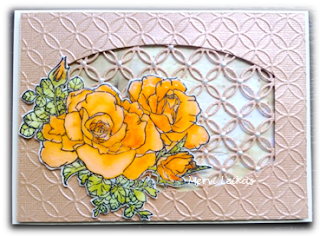 Thank you for sharing your fabulous card with us at Stamping Sensation.